Oh you got barz huh? Then come spit ’em at MIC MADNESS. The best act gets a $100.00 Visa gift card. Dancers, rappers, singers, bands, poets and everyone else 14-21 are welcome to compete! You must email micmadnesscompetition@gmail.com to enter the competition. 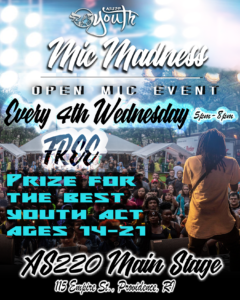 Every 4th Wednesday of the month at AS220 Main Stage!